- from John M., CDx3 Notification Service subscriber. See more preferred stock investor reviews here. There are currently 127 high quality preferred stocks selling for an average price of $24.81 per share (investment grade, cumulative dividends). 60 of these high quality issues are now selling below their $25 par value, offering an average current yield of 5.5 percent. Figure 1 shows the complete filter used to find the highest quality preferred stocks available for less than $25. 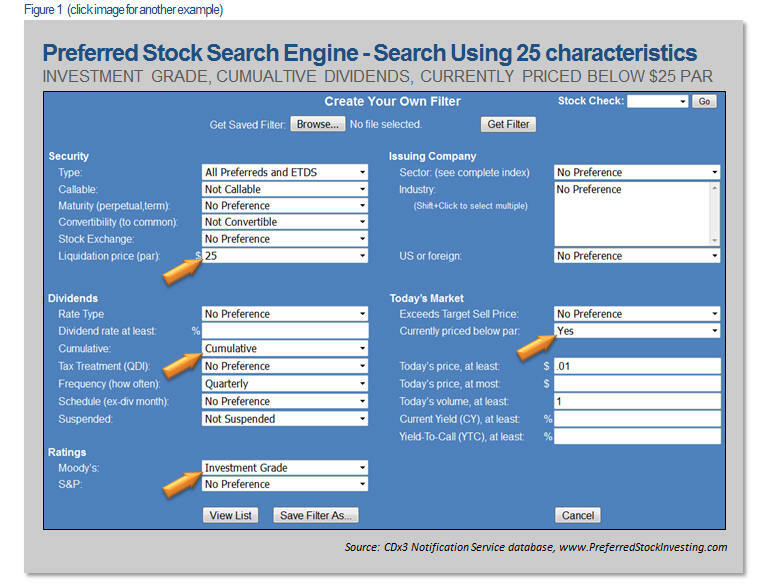 Of the twenty-five preferred stock characteristics that can be set, the four arrows highlight the keys for this search. Setting the "Currently priced below par" parameter to "Yes" does the magic here. 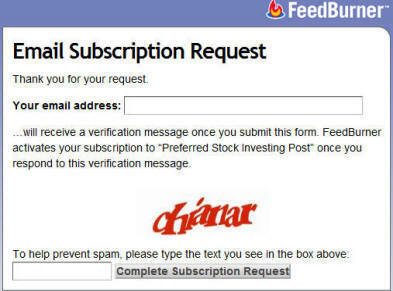 Figure 2 shows the results when this search is applied to our Preferred Stock ListTM database, with ETDS shown in green font (please note that to protect the values of subscriptions to our CDx3 Notification Service, trading symbols are obscured here). Already a CDx3 Notification Service subscriber? 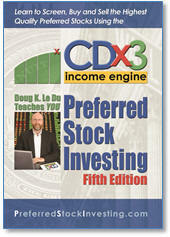 See page 1 of this month's issue of the subscriber's newsletter, CDx3 Research Notes, for symbols. There were a total of 894 preferred stocks and ETDs trading on U.S. stock exchanges as the month came to a close (including convertible preferred stocks). Of these 894, these are the top ten highest quality issues that are trading below their $25 par value. This list is sorted by dividend rate (coupon) with the highest payers listed first. All of these high quality securities have a current market price (seen in the Last Price column) that is below their $25 par value (as shown in the Liquid Price column) and enjoy an investment grade rating from Moody's. Keep an eye out for sub-$25 buying opportunities such as those listed here. The lower your purchase price, the more principal protection you'll have. The securities listed in Figure 2 are offering some of the best choices available to you as an income investor. The upward pressure on preferred stock prices that we saw during January continued throughout February. As the month came to a close, the average market price for all U.S. traded preferred stocks was $24.72, up $0.15 per share over the last month. The good news is that $24.72 is still below these securities’ $25.00 par value. Remember that the par value is what shareholders will receive in cash should the issuing company decide to redeem your shares so buying shares below par sets you up for a downstream capital gain on top of the regular dividend income provided by these securities. February’s six new preferred stocks are offering an average annual dividend (coupon) of 6.5 percent, an average current yield (which does not consider reinvested dividends or capital gain/loss) of 6.5 percent and an average Yield-To-Call (which does consider reinvested dividends and capital gain/loss) of 6.4 percent (using February 28 prices). Note that I am using IPO date here, rather than the date on which retail trading started. The IPO date is the date that the security’s underwriters purchased the new shares from the issuing company. 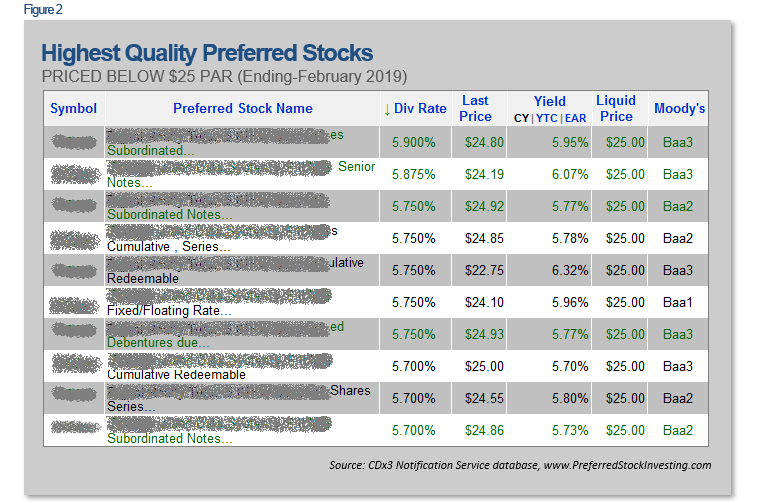 There are currently 127 high quality preferred stocks selling for an average price of $24.81 (February 28), offering an average current yield of 5.6 percent. And 60 of these high-quality issues are selling below their $25 par value, offering an average current yield of 5.5 percent. By high quality I mean preferreds offering the characteristics that most risk-averse preferred stock investors favor such as investment grade ratings and cumulative dividends. There is now a total of 894 of these securities trading on U.S. stock exchanges (including convertible preferred stocks). Note that PRNCP from Priority Income Fund, SFEIP from Stifel Financial (SF) and ALSCP from Air Lease Corporation (AL) are still trading on the wholesale Over-The-Counter exchange. These are temporary OTC trading symbols until these securities move to their retail exchange, at which time they will receive their permanent symbols. Those who have been following this strategy of using the wholesale OTC exchange to buy newly introduced shares for less than $25 are more able to avoid a capital loss if prices drop (if they choose to sell). Your broker will automatically update the trading symbols of any shares you purchase on the OTC. PRNCP will become PRIF-C, SFEIP will become SF-B and ALSCP will become AL-A. CHMI-B is an unrated, traditional preferred stock from Cherry Hill Mortgage Investment Corporation (CHMI). This security offers cumulative dividends using the fixed-to-float rate structure, paying 8.25 percent until its April 15, 2024 call date. The rate becomes variable at that time, using the three-month LIBOR rate (currently at 2.64 percent) plus 5.631 percent. Page S-16 of the prospectus explains how the floating rate will be calculated should the 3-month LIBOR become unavailable. CHMI is a $300 million mortgage REIT, meaning that rather than owning physical properties as a property REIT would, the company seeks to generate earnings from the spread between yields on its investments and its cost of borrowing. Its investments are bundles of mortgages (primarily residential), many of which can be long-term in nature. Consequently, during periods of increasing interest rates, the shorter-term cost of borrowing tends to increase while revenues tend to be locked in at lower rates for longer periods of time. This math often squeezes the earnings of mortgage REITs, requiring nimble management of their investment portfolio (often moving toward bundles of variable rate and/or shorter-term mortgages). CMSD from CMS Energy Corporation (CMS) is an Exchange-Traded Debt Security, also referred to as a baby bond, paying 5.875 percent in annual interest. ETDS’ are bonds recorded on the company’s books as debt (rather than as equity, as in the case of preferred stock). As debt, the obligation to pay the interest on these bonds is cumulative. As bonds, ETDS’ are often seen as having lower risk than the same company’s preferred stock shares. ETDS are very similar to preferred stocks and are often listed on brokerage statements as such. CMSD offers double investment grade ratings. CMS, founded in 1987, is the largest electric and natural gas utility in Michigan through its principal subsidiary Consumers Energy Company. FDUSZ is an ETDS offered by Fidus Investment Corporation (FDUS), paying 6.0 percent in annual interest. Fidus is incorporated as a business development corporation, investing in various types of small businesses within the United States. This bond becomes callable on February 15, 2021 (a relatively short two-year call protection period) and matures on February 15, 2024. The company has two ETDS trading, with FDUSL being a $43 million issue introduced a year ago. FDUSZ is a $60 million issue, half-again the size of FDUSL. These two debt securities represent about a third of the company’s $380 million market value. PRNCP/PRIF-C is an unrated traditional preferred stock issued by the Priority Income Fund offering 6.25 percent dividends. The fund is managed by Priority Senior Secured Income Management, LLC which, in turn, is part of the Destra Capital Investment, LLC stable. On their website, the fund’s objectives are stated in the most non-specific terms possible as “Priority Income Fund seeks to generate current income and long-term capital appreciation by strategically investing in broad pools of senior secured, floating rate loans made primarily to U.S. companies. The Fund's goals are to increase income and portfolio diversification and reduce correlation to traditional fixed-income assets.” (make some investments and make some money). PRNCP is the fund’s third preferred stock offering in the last eight months. While the prior two securities offered cumulative dividends, the new PRNCP’s dividends are non-cumulative. Neither Destra nor Priority Senior Secured Income Management, LLC are publicly traded. SFEIP/SF-B is from Stifel Financial Corporation (SF), the company’s third currently-trading income security and its first issue since September 2017. This security is nearly identical to SF-A issued in July 2016. SFEIP pays non-cumulative 6.25 percent annual dividends and has a speculative grade BB- rating from S&P. Stifel is a $4 billion investment banking company with global operations. Looking at their financials, the company posted a very strong 2018 with Net Income From Operations more than doubling their 2017 performance. Revenue was up while expenses were down and the company has very health cash flow (from which preferred stock dividends are paid). From their 2018 financials, it is unclear why S&P is sticking with their miserly BB- rating. Stifel was founded in 1890 and is headquartered in St. Louis, Missouri. ALSCP/AL-A is from Air Lease Corporation (AL) and is a non-cumulative traditional preferred stock offering a 6.15 percent annual dividend and a BB+ S&P rating. ALSCP is the company’s only income security. Like CHMI-B discussed above, this security’s 6.15 percent dividend is fixed until its March 15, 2024 call date. At that time, the dividend rate will float and will equal the three-month LIBOR plus 3.65 percent. Air Lease leases its 275 aircraft and intends on using the $250 million in proceeds from ALSCP to pay down debt. The $4.2 billion company was founded in 2010 and is headquartered in Los Angeles. But remember that REITs do the same thing as LLC’s – at least 90 percent of a REIT’s earnings are passed to the REIT’s shareholders primarily in the form of preferred stock dividends; the shareholders then pay the tax on their personal returns. In other words, preferred stock dividends received from REITs qualify under the Act’s “pass-through income” provision and are therefore up to twenty percent deductible. Put another way, you can reduce your taxable dividend income from REIT dividends by up to twenty percent under the 2017 Tax Act. Check your 1099’s for a line labeled “Section 199A dividends” and be sure to consult your tax accountant. The tax treatment of the taxable income you receive from income securities can be a bit confusing, but it really boils down to one question – Has the company already paid tax on the cash that is being used to pay you or not? If not, the IRS is going to collect the full tax from you; if so, you still have to pay tax, but at the special 15 percent rate. Traditional preferred stock dividends are typically paid out of pre-tax profits so are taxable as regular income; you pay the full tax since the company has not. Companies incorporated as REITs (CHMI-B) are required to distribute at least 90 percent of their pre-tax profits to shareholders. Doing so in the form of non-voting preferred stock dividends is the most common method of complying and because these dividend payments are made from pre-tax dollars, dividends received from REITs are taxed as regular income (i.e. they do not qualify for the special 15 percent dividend tax rate). Interest that a company pays to those loaning the company money is a business expense to the company (tax deductible), so the company does not pay tax on the interest payments it makes to its lenders (i.e. interest payments made to lenders are paid with pre-tax dollars). Since Exchange-Traded Debt Securities are debt, ETDS shareholders are on the hook for the taxes. Income received from ETDS’ is taxed as regular income (CMSD, FDUSZ). Lastly, if a company pays your preferred stock dividends out of its after-tax profits, the dividend income you receive is taxed at the special 15 percent tax rate. Such dividends are referred to as “Qualified Dividend Income” or QDI. QDI preferred stocks are often seen as favorable for holding in a non-retirement account due to the favorable 15 percent tax treatment. Looking at the Status column in the above table, the prospectuses for three of February’s new issues state that their dividends are QDI-qualified (PRNCP, SFEIP, ALSCP). Note that I saw one report stating that only a portion of the dividend received from PRNCP will be QDI (which I have never seen before) so you may want to contact the issuer for clarification. 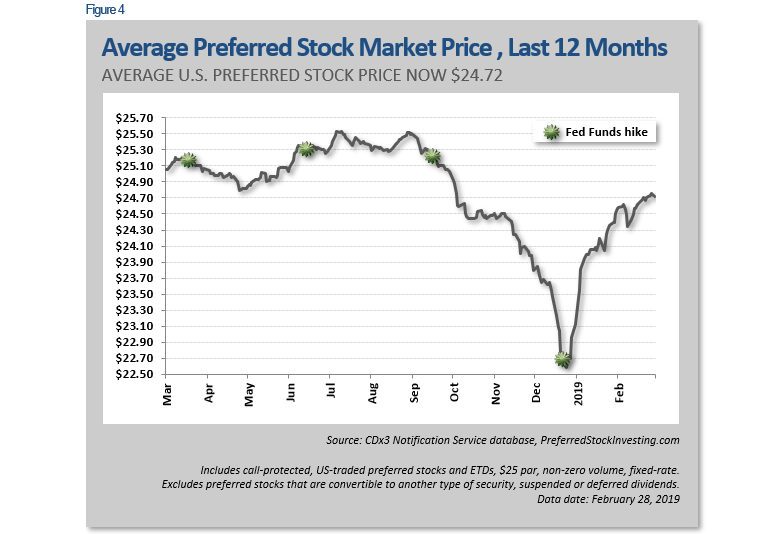 The following chart illustrates the average market price of U.S.-traded preferred stocks over the last twelve months. Many things affect the market prices of these securities such as the proximity to their call or maturity date, proximity to their next ex-dividend date, industry and/or overall health of the issuer, perceived direction of interest rates, pending government regulatory or policy changes, cumulative versus non-cumulative dividends and tax treatment of dividend payments. So what we really need to look at is current yield, which calculates the average annual dividend yield per dollar invested (without considering re-invested dividend return or any future capital gain or loss). Current yield is a “bang-for-your-buck” measure of value that normalizes differences in coupon rate and price to give us a single, comparable metric. Moving down the risk scale, the next chart compares the average current yield realized by today’s preferred stock buyers when compared to the yield earned by those investing in the 10-year Treasury note or 2-year bank Certificates of Deposit. The cost of money has not changed much since the end of last month. 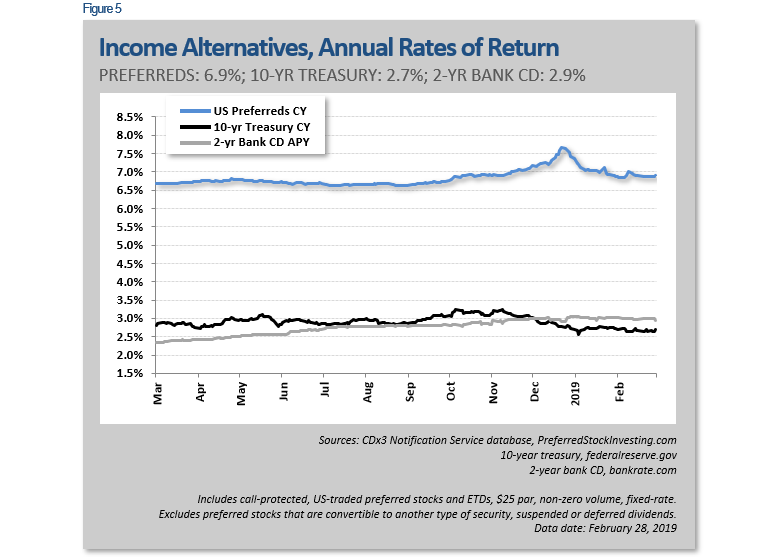 U.S.-traded preferred stocks are currently returning an average current yield of 6.9 percent (blue line) while the annual return being offered to income investors by the 10-year treasury is 2.7 percent and that of the 2-year bank CD has turned the yield curve upside down at 2.9 percent (shorter term money very rarely offers a higher return than longer term money). For comparison, I have set the Yield column in the first table above to show the current yield of the new February preferreds on February 28. It is into this marketplace that February’s new issues were introduced. Preferred Stock Investing is one of the highest reader-rated books in the United States with over 100 reviews posted at Amazon. (c) 2019 Del Mar Research, LLC. All rights reserved.